As mentioned in my previous blog entry on my “new” 3DS, I’ve been playing Pokemon X for a good while now. As of posting this blog entry, I’m still playing through it at a casual capacity. I intend to eventually get the games from every generation and play through them, maybe even complete them. In the meantime, this is a blog entry about my limited experience with the Pokemon game franchise. I’m a casual fan of Pokemon who has played and finished some of the games before and I know enough of the lore to relate to most discussions about it, but not enough to talk about stuff like the Pokemon Trading Card Game. I’ve watched a good bit of the Pokemon anime series and some of the movies, as well as read the manga and even VG Cats’ Super Effective webcomic. I first caught wind of the first-generation Pokemon games back when I was 13, which was when I started to really get into gaming with titles like Quake II, Half-Life, Diablo, StarCraft, WarCraft II, and Counter-Strike (when it was starting to pick up, just before they removed the scope off the M4 Carbine). This was back in 1999, when the Y2K bug was a threat, gaming was more niche than now, and the world was just a bit more carefree. Having a GameBoy required begging parents for one, and they could then get confiscated if we took them to school. Not being able to play Pokemon on GameBoy in school with our friends defeated the point of having one in the first place, which was why most of us played through GameBoy emulators. We’d play them at home, then bring our saves on floppy drives to the gaming shop to compare progress and Pokemon teams. That was also when we first learned of the Missingno glitch and other ways to “cheat” in the game, and this was when I would still use cheats for almost everything I played. The fad later died down as the popularity of the animated series petered out in local television, so we then diverted our attention to other games like Battle Realms and WarCraft III. The Pokemon TCG also came up back then, but I never got into that since I was playing Magic: The Gathering. Pokemon itself never became a thing for me again until much later on. When I was studying Multimedia Arts, I somehow had the urge to play Pokemon. Perhaps it was the appeal of collecting and the consistency of the franchise that enticed me. I wanted to complete the games, from FireRed/LeafGreen to Diamond/Pearl (current at that time). I bought a GameBoy Micro to play Sapphire and a DS to play Diamond, and they did get me through some tough times. I remember Pokemon Diamond being the first thing I ever bought with my salary from freelancing (I purchased it from Play-Asia, shipping costs and all). Sadly, while I did have a considerable bit of fun with the games, it hit a wall rather abruptly. When I lost my save in Sapphire for the second time, it killed the passion right then and there. At that time, I was trying to catch a Feebas to evolve into a Milotic, but the effort was made null with the cartridge giving up the ghost. I had subsequently sold the GameBoy Micro (maybe a mistake as I want one again) and lent my DS to a friend. That was the end of my handheld gaming experience for a few years. As mentioned in that blog entry, I had recently acquired a 3DS. This time though, I didn’t get it simply to play Pokemon, but also other titles like Fire Emblem: Awakening and Bravely Default. But as mentioned, Pokemon X was the first game I picked up for it. The difference between 5 years ago and now is that I have the time and resources to support my gaming hobby this time around (and also because it’s part of my job). However, time investment is something that I still won’t have much room for though, so it’s not likely that I’ll be getting into competitive play. That means I won’t be obsessing over my Pokemon roster’s EVs anytime soon. I intended to speedrun Pokemon X at first, playing it tornado style like I usually do with most other games. But then again, with the way Pokemon games are usually structured, there’s no real good way to “speedrun” it without prior planning since it all involves grinding out levels for each Pokemon you end up using. There was also no way I could blindly skip through the narrative (or whatever is there since it’s a Pokemon game). 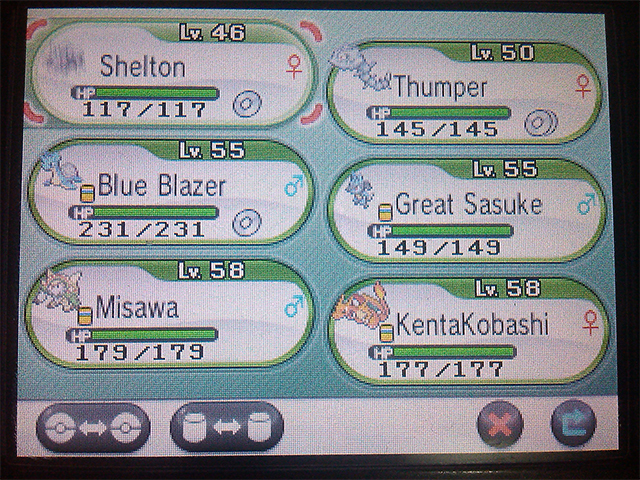 In the end, it was really about assembling a reliable team that I could smash with in battles. Compared to older titles though, this game does give quite a bit more leeway (like how the Heart of the Swarm campaign in StarCraft II was much easier than the Wings of Liberty campaign). Taking upon an irreverent attitude towards the game for the hell of it, I named my Pokemon mostly after pro wrestlers (although I named my Combee as “wat”). Things did start coming back to me, especially the Pokemon that I recalled from the days of playing Sapphire. I grew quite fond of the Generation III of Pokemon as there were some solid designs in the new Pokemon at that time. My favorite was Aggron due to its design; Flygon and Salamence closely follow. What really got me scratching my head though was some of the weird Pokemon designs that I only got a glimpse of now, like Combee, Doublade, Vanillish, Klink, and many others. Perhaps I shouldn’t complain since Pokemon designs have always been out of the ordinary anyway (Dugtrio and Weezing comes to mind), but these ones do look as if the designers were digging deep into the void to come up with new stuff, so there were bound to be some misses. I also couldn’t help but furrow my brow a bit at the Mega Evolution, which is basically a Super Saiyan power-up mechanic. In fact, the full transformation sequence with the trainer using the Mega Ring looks almost exactly like the Henshin sequence of Zanki from Kamen Rider Hibiki. 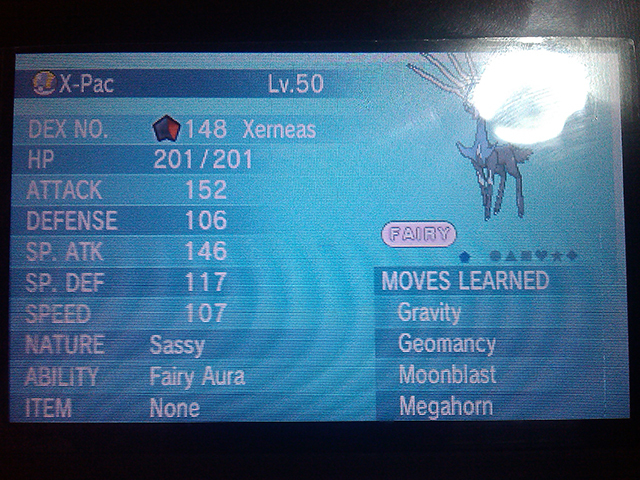 It just so happens that at around the same time when I decided to play Pokemon X, that’s when this amazing thing happened. Twitch Plays Pokemon (TPP) has become an online phenomenon and plenty of articles and commentaries have been posted everywhere about it. It’s definitely one of the most interesting and entertaining things to happen online. For those who don’t know anything about TPP, you can consult >this Reddit post on the stream’s subreddit. I had been observing this stream for quite a while now, and it’s definitely one of the great social experiments in recent memory. As of posting this blog entry, they had finished Pokemon Blue and just started a new game in Pokemon Crystal. After finishing Pokemon X, I’ll go on to my old Pokemon Diamond cart, then to subsequent games. I may even buy a new GameBoy Micro to play the GBA ones as well for kicks, so long as I can keep the saves long enough to use them for Pal Park (if I can use the first-gen DS that I lent my friend). I might also avail of the 3DS Pokemon promo on Club Nintendo and get a digital copy of Pokemon Y. I can then replay the whole thing and do a better playthrough in my spare time. With more free time and a good format, I may also record a Nuzlocke playthrough with Pokemon FireRed for my YouTube channel. In the meantime, I’m tuning in to the Nuzlocke videos of The Best Friends Zaibatsu. I’m also getting a bit interested in observing the competitive side of Pokemon due to the strategic and tactical elements that I’ve seen. It feels a bit like Magic: The Gathering, coming up with your own team by considering strengths, weaknesses, dynamics, and the competition involved. I’m stuck with StarCraft II and I’m not really feeling it with Hearthstone, so maybe I should follow competitive Pokemon. We’ll see what happens.